The number of patients with cirrhosis who require surgery is on the rise. Despite advances in antiviral therapeutics, the prevalence of cirrhosis secondary to hepatitis C continues to increase, as does the prevalence of cirrhosis due to chronic alcoholic liver disease. Additionally, nonalcoholic fatty liver disease (NAFLD) and nonalcoholic steatohepatitis (NASH) are gaining more attention, especially in association with metabolic syndrome and obesity. At the same time, the amount of medications and treatments aimed at improving survival among patients with cirrhosis has been increasing. Therefore, it can be expected that a growing number of patients with liver disease, both known and as yet undiagnosed and asymptomatic, will undergo surgery. An estimated 1 in 700 patients admitted for elective surgery has abnormal liver enzyme levels. Some authors have estimated that as many as 10% of patients with advanced liver disease will undergo surgery in the last 2 years of their lives. This article focuses on the challenges of perioperative care of patients with liver disease. Identification of the surgical risk is imperative in the care of any patient, especially as patients develop an increasing number of chronic comorbid medical conditions. Patients with liver disease are at particularly high risk for morbidity and mortality in the postoperative period due to both the stress of surgery and the effects of general anesthesia. del Olmo et al compared 135 patients with cirrhosis with 86 patients without cirrhosis, all undergoing nonhepatic general surgery. At 1 month, mortality rates were 16.3% for patients with cirrhosis compared with 3.5% in the control group. What is further evident in the literature is that decompensated liver disease increases the risk of postoperative complications (eg, acute hepatic failure, infections including sepsis, bleeding, poor wound healing, and renal dysfunction). Assessing risk in these patients is a challenging but important endeavor. The liver is vital for protein synthesis, coagulation homeostasis, glucose homeostasis, bilirubin excretion, drug metabolism, and toxic removal, among other critical functions. In general, the liver has substantial functional reserve because of its dual blood supply: portal-venous (75%) and hepatic-arterial (25%). Hence, clinical manifestations of liver damage occur only after considerable injury. Liver disease comprises a large spectrum of hepatic dysfunction. It includes asymptomatic transaminitis, cirrhosis, and end-stage liver disease. The most common causes of advanced liver disease are chronic viral infections (hepatitis C [HCV] and B [HBV]), alcohol abuse, NAFLD/NASH , autoimmune disease, drugs or toxins, metabolic disorders (eg, alpha-1 antitrypsin deficiency, hemochromatosis, and Wilson disease), and biliary tract diseases. For patient education resources, see the Hepatitis Center and Liver, Gallbladder, and Pancreas Center, as well as Liver Transplant and Cirrhosis. Secondary to the loss of hepatic reserve capacity and because of other systemic derangements that are the result of liver dysfunction (such as hemodynamic impairments), patients with liver disease have an inappropriate response to surgical stress. These individuals are accordingly at an increased risk of bleeding, infection, impaired wound healing, postoperative hepatic decompensation, including hepatic coma or death. Therefore, the decision to perform surgery in these patients must be heavily weighed. Prediction of surgical risk is based on the degree of liver dysfunction, the type of surgery, and the preclinical status of the patient. The extent of liver dysfunction and type of surgery play key roles in determining a patient’s specific risk. In addition, liver disease can affect almost every organ and system in the body, including the cardiorespiratory and circulatory systems, the brain, the kidneys, and the immune system. 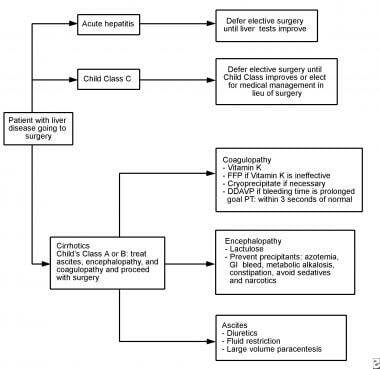 Algorithm for a patient with liver disease for whom surgery is being considered. Two risk stratifications schemes have been used to estimate the perioperative risk of patients with cirrhosis: the Child-Turcotte-Pugh score and the Model for End-Stage Liver Disease (MELD) score. The Child-Turcotte-Pugh (CTP) score incorporates a combination of 3 biochemical elements (ie, prothrombin time [PT], albumin level, and bilirubin level) and 2 clinical features (ie, presence of ascites and encephalopathy) to assess the primary functions of the liver (see the table below). A patient’s score is translated to 1 of 3 CTP classes: A, B, or C, with A reflecting the least severe disease. Patients who are CTP class B and C have worse outcomes and are candidates for liver transplantation. The MELD score was originally developed to predict short-term mortality for patients undergoing transjugular intrahepatic portosystemic shunt (TIPS) placement. It has since been adopted as the tool to prioritize patients with cirrhosis for liver transplantation. The MELD score is based on a patient's serum bilirubin, creatinine, and international normalized ratio (INR) for prothrombin time and is calculated from a validated predictive equation, as follows: (3.8 × ln bilirubin value) + (11.2 X ln INR) + (9.6 ln creatinine value), where bilirubin and creatinine values are in milligrams per deciliter (mg/dL) and ln represents natural logarithm. See the MELD Score calculator. The MELD score originally included the etiology of liver failure, but this criterion was subsequently dropped from the equation because it was proved prognostically insignificant. The Organ Procurement and Transplantation Network (OPTN) also provides an online calculator. In general, the MELD score fairs well compared to the CTP score. However, some might argue that the MELD score may be a more objective predictor of postoperative mortality than the CTP score, [11, 12, 15, 16] especially as patients fall along a continuum of values instead of into 3 discrete groups. Teh et al performed a retrospective, multivariate analysis that showed among patients with cirrhosis undergoing multiple types of major surgeries, the MELD but not the CTP score predicted increased mortality at 30 and 90 days, 1 year, and over the long term. Age and American Society of Anesthesiologists (ASA) class also predicted postoperative mortality. The MELD was the strongest predictor of mortality after 7 days and over the long term. For example, the 30-day mortality associated with MELD < 8 was 5.7% but >50% for MELD score >20. The relative risk of mortality also increased 14% for each 1 point increase in the MELD score. The ASA physical status class risk stratification system is based on comorbid conditions that are a threat to life or that limit activity and thus helps in predicting preoperative risks. In general, an ASA class greater than 2 increases the risk 1.5- to 3.2-fold. The ASA class independently predicted postoperative mortality in patients undergoing hepatic resection for hepatocellular carcinoma. Teh et al also found the ASA class significantly predicts increased mortality and morbidity among patients with cirrhosis undergoing major surgery, with ASA class V the strongest predictor of postoperative mortality at 7 days. The mortality related to ASA IV was the equivalent of 5.5 MELD points in terms of risk. The evaluation of any patient undergoing surgery should include thorough history taking and physical examination. In asymptomatic patients, this is an extremely valuable screening tool. Risk factors (eg, pervious blood transfusions, tattoos, illicit drug use, sexual history, alcohol use, and personal or family history of jaundice) for liver disease should be explored. Though most studies have focused on patients with end-stage liver disease or cirrhosis, patients with fulminant hepatic failure have been associated with an increased risk of surgical morbidity and mortality . This also applies to patients with acute alcoholic hepatitis and acute viral hepatitis. Patients with these conditions tend to have morbidity rates higher than those with chronic cholestatic disease. Therefore, it is prudent to postpone surgery, especially elective surgery, until transaminitis is resolved. Patients with chronic liver disease but with preserved hepatic function may not have an increased operative risk,  but these individuals need to be closely evaluated nonetheless. In patients with known liver disease, especially with cirrhosis, optimal preparation for surgery, that appropriately addresses the primary features and secondary manifestations of liver disease may decrease the risk of complications or death after surgery. This includes laboratory tests to assess blood counts, coagulopathy, electrolyte abnormalities, and markers of hepatic synthetic function. Coagulopathy is one of the primary features of advanced liver disease. In addition to hepatic synthetic dysfunction (all of the coagulation factors with the exception of von Willebrand factor are produced in the liver), malnutrition and vitamin K malabsorption due to cholestasis contribute to this abnormality. Additionally, portal hypertension leads to hypersplenism with resultant platelet trapping and peripheral thrombocytopenia. Vitamin K supplementation and administration of fresh-frozen plasma (FFP) are recommended to correct coagulopathy before surgery. Cryoprecipitate might also be required to reduce the prothrombin time. A prolongedbleeding time can also be corrected with diamino-8-D-arginine vasopressin (DDAVP). Finally, platelet transfusion (see platelets) may be necessary based on the patient’s platelet level and the desired level as dictated by the type of surgery. Ascites is important to assess and manage before surgery because it can lead to wound dehiscence, abdominal wall herniation, and respiratory compromise secondary to reduced lung expansion. In a study by Conn, ascites in patients with cirrhosis was associated with a 37-83% mortality rate compared with 11-53% in those without ascites. In general, ascites should be treated aggressively with diuretics and/or large-volume paracentesis before surgery. A low sodium diet is another important component of ascites management. Patients on diuretics need to have their creatinine and electrolytes monitored. Ascites fluid can also be removed intraoperatively at laparotomy. It is important to take note of the volume of fluid removed and the patient’s baseline renal function and to consider albumin repletement to maintain intravascular volume and prevent paracentesis-induced circulatory dysfunction. Ascitic fluid should also be analyzed to rule out spontaneous bacterial peritonitis. Multiple factors in the preoperative and postoperative periods may precipitate encephalopathy, such as infection and/or sepsis, diuretics, hypokalemia, metabolic alkalosis, constipation, use of central nervous system (CNS) depressants such narcotics and benzodiazepines, hypoxia, azotemia, and gastrointestinal bleeding. Addressing the underlying precipitant through correction of electrolyte abnormalities, treatment of infection, management of gastrointestinal bleeding, and restriction of sedatives may help prevent or decrease encephalopathy. Hepatic encephalopathy is also often treated by administering lactulose or poorly absorbed antibiotics such as rifaximin. Patients with chronic liver disease are at risk for renal dysfunction at baseline due to the propensity for hemodynamic derangements that increase the risk of renal hypoperfusion. This risk is increased by diuretics, nephrotoxic agents including nonsteroidal anti-inflammatory drugs (NSAIDs), large-volume paracentesis performed without albumin supplementation, infections, and gastrointestinal bleeding. Hepatorenal syndrome is another concerning occurrence in this patient population. Pulmonary complications of end-stage liver disease include hepatopulmonary syndrome, portopulmonary hypertension, and hepatic hydrothorax. Hepatopulmonary syndrome is associated with vascular shunt, and the risk of hypoxia and ventilation-perfusion mismatch should be addressed before surgery. Portopulmonary hypertension can eventually lead to right heart failure and hypoxia. Hepatic hydrothorax, usually unilateral and in the right hemithorax, can occur and impair ventilation. However, the associated hypoxemia is usually not severe. Drainage is usually not recommended because the effusion often rapidly reaccumulates. Finally, the risk of chronic obstructive pulmonary disease (COPD) should be assessed in any patient who has previously smoked tobacco or who has alpha-1 antitrypsin deficiency. In patients with end-stage liver disease, steps to improve nutritional health should be started, preferably in the preoperative period, because they are expected to have increased energy expenditure after surgery. Supplements can be used. Patients with alcoholic liver disease and Wernicke encephalopathy benefit from preoperative vitamin B-1 supplementation. Advanced liver disease can also predispose to hypoglycemia because of impaired gluconeogenesis and decreased glycogen stores. Patients with autoimmune hepatitis on daily steroids may be appropriate candidates for stress-dosed steroids with surgery, depending on their average daily steroid dose. D-penicillamine can impair wound healing; patients taking it for Wilson disease should decrease their dose for 1-2 weeks preoperatively and postoperatively. Wilson disease might predispose to an increased risk of neurologic changes postoperatively. Patients with hemochromatosis should be assessed for a history of extrahepatic hemochromatosis-related complications, such as diabetes or cardiomyopathy. In addition, it is worth noting that patients with a history of alcohol abuse are at increased risk of other complications, including poor wound healing, bleeding, delirium, and infections. Patients who have continued to actively drink are at risk for withdrawal. Though studies indicate that preoperative alcohol cessation improves outcomes, patients with cirrhosis were excluded from the intervention. [40, 41] However, it seems reasonable to recommend a period of abstinence for patients with known chronic liver disease/cirrhosis or to delay elective surgery until such can be achieved. Impaired hepatic synthetic function and derangement of other hepatic functions are especially pertinent to note when choosing anesthetic and other agents used in the perioperative period. These changes include decreased synthesis of plasma-binding proteins. Hypoalbuminemia impairs drug binding and metabolism and elevates serum drug levels. Impaired drug metabolism, detoxification, and excretion by the liver can prolong drug half-lives. Thus, the absorption, distribution, metabolism, and excretion of anesthetics, muscle relaxants, analgesics, and sedatives may be affected. Patients with liver disease are more likely than patients without liver disease to have hepatic decompensation with the use of anesthesia. General anesthesia reduces total hepatic blood flow, especially the contribution of the hepatic artery. Patients with liver disease tend to have several baseline cardiovascular abnormalities, including decreased systemic vascular resistance and increased cardiac index, which may further affect hepatic blood flow. In addition, catecholamine and other neurohormonal responses are impaired in patients with liver disease; therefore, intraoperative hypovolemia or hemorrhage may not trigger adequate compensatory mechanisms. Anesthetics causing sympathetic blockade further blunt this response. The result of this reduction in hepatic perfusion is a drastic loss of their remaining marginal hepatic function. Of all the inhaled anesthetics, halothane and enflurane appear to reduce hepatic artery blood flow the most because of systemic vasodilation and a mild negative inotropic effect. [31, 42, 43, 44] Halothane is also associated with the greatest risk of hepatotoxicity, with the incidence of fulminant hepatitis approximating 1 case in 6,000-35,000 patients after exposure. Isoflurane has fewer effects on hepatic blood flow and less hepatic metabolism ; it is the preferred anesthetic agent in patients with liver disease. Newer haloalkanes, such as sevoflurane and desflurane, also undergo less hepatic metabolism than halothane or enflurane. Cholecystitis and cholelithiasis are common in patients with liver disease. The odds ratio for perioperative mortality in patients with liver disease who undergo cholecystectomy is 8.47. In fact, open cholecystectomy in patients with cirrhosis has been called a formidable operation, although recent studies have demonstrated lowered but still considerable mortality rates in patients with cirrhosis who undergo abdominal surgery. Perkins et al confirmed that a MELD score greater to or equal to 8 predicts an increased risk of postoperative complications in this type of surgery  (see the MELD Score calculator). Patients undergoing emergency surgery are at substantial risk for liver dysfunction. Intuition suggests, the more urgent the surgery, the less opportunity that is available to correct reversible factors, such as electrolyte abnormalities, coagulopathy, and clinical manifestations of portal hypertension (eg, ascites, hepatic encephalopathy). Emergency surgery is an important predictor of adverse outcome. In a series of 100 patients with cirrhosis who underwent abdominal surgery for a variety of reasons, 80% of nonsurvivors and 40% of survivors who had serious complications had undergone emergency surgery. A series of 92 patients with cirrhosis who underwent abdominal surgeries had a 50% mortality rate in association with emergency procedures (22% for CTP class A, 38% for CTP class B, 100% for CTP class C) versus 18% for elective surgery (P = 0.001). This study showed that the most accurate predictor of outcome is the patient's preoperative CTP class. More specifically, cirrhosis diagnosis made at the time of laparotomy for trauma is associated with an increased risk of mortality (45% vs 24%). Another study confirmed the elevated mortality when cirrhosis and trauma combined: 12% versus 6% overall mortality, 40% versus 15% mortality after emergent abdominal exploration. [64, 65] Postoperative ICU admission and care is recommended for such patients, even for mild injuries. Relatively noninvasive techniques or advances in medical management have replaced surgical intervention for many conditions (eg, extrahepatic biliary obstruction, refractory variceal hemorrhage, coronary artery disease). TIPS has become the treatment of choice for managing cases of refractory variceal bleeding, and surgical shunts are created only in special circumstances. Percutaneous stenting or endoscopic retrograde cholangiopancreatography (ERCP) is now commonly used for biliary strictures and choledocholithiasis. Coronary angioplasty and percutaneous coronary interventions have decreased the need for coronary artery bypass grafting (CABG). The use of proton-pump inhibitors (PPIs) along with antibiotic treatment of Helicobacter pylori has usurped the need for surgical treatment of peptic ulcer disease (PUD) with antrectomy and/or vagotomy. In patients with cirrhosis, liver failure is the most common cause of postoperative death. Hepatocellular injury is most commonly due to the effects of anesthesia, intraoperative hypotension, sepsis, or viral hepatitis. A low threshold is generally maintained for postoperative transfer to the intensive care unit (ICU). Patients must be observed closely for signs of acute hepatic decompensation, such as worsening jaundice, encephalopathy, and ascites. Sedatives and pain medications should be carefully titrated to prevent an exacerbation of hepatic encephalopathy; the increased half-life of hepatically metabolized drugs will make patients with liver disease more sensitive to standard doses. Benzodiazepines can be particularly problematic in patients predisposed to hepatic encephalopathy. Poor stooling, for example due to postoperative ileus or narcotic- or immobility-related constipation, despite lactulose dosing, can also contribute to postoperative encephalopathy. Serious sequelae of decompensated cirrhosis include severe sepsis and secondary disseminated intravascular coagulation (DIC). These potential complications emphasize the need for maintaining a low threshold for ICU-level monitoring. Surgery in a patient with liver disease, especially end-stage liver disease with cirrhosis and portal hypertension, poses a formidable challenge for all physicians involved. Targeted interventions before surgery may help to prevent complications and improve outcomes. The cornerstones of perioperative management are medical treatment of the complications of liver disease, including coagulopathy, ascites, encephalopathy, and malnutrition. Attention must also be paid to risk factors for infection and renal dysfunction after surgery. Sepsis, coagulopathy, and emergency surgery are most strongly correlated with postoperative mortality. Evolving knowledge of the effects of anesthesia, improving surgical techniques, and use of improved diagnostic tests will help reduce perioperative complications. Established risk stratification systems such as the CTP score, the MELD score, and the ASA physical status class should also be used when evaluating a patient with liver disease for potential surgery. Surgery-specific factors should also be strongly weighed. Therefore, a multidisciplinary approach to postoperative care is imperative and should include input from anesthesiologists, surgeons, internists, and hepatologists. Surgery is contraindicated in patients with CTP class C, high MELD score, ASA class V, acute hepatitis, severe coagulopathy, or severe extrahepatic manifestations of liver disease (eg, acute renal failure, hypoxia, cardiomyopathy). Avoid surgery if possible in patients with a MELD score of greater than or equal to 8 or CTP class B unless they have undergone a thorough preoperative evaluation and preparation. Use caution with sedatives and neuromuscular blocking agents. Optimize medical therapy for patients with cirrhosis. Correct coagulopathy with vitamin K and FFP to achieve prothrombin time within 3 seconds of normal. The goal platelet count is >50-100 × 103/L but may vary depending on the specific surgery. Minimize ascites to decrease risk of abdominal-wall herniation, wound dehiscence, and problems with ventilation. Admission to the ICU may be appropriate after prolonged surgeries, intraoperative hypotension, excessive blood loss, or cardiac and/or pulmonary surgery. Monitor for signs of acute liver failure, including worsening jaundice, encephalopathy, and ascites. Monitor and correct electrolyte abnormalities, especially hypokalemia and metabolic alkalosis. Garrison RN, Cryer HM, Howard DA, Polk HC Jr. Clarification of risk factors for abdominal operations in patients with hepatic cirrhosis. Ann Surg. 1984 Jun. 199(6):648-55. [Medline]. [Full Text]. del Olmo JA, Flor-Lorente B, Flor-Civera B, et al. Risk factors for nonhepatic surgery in patients with cirrhosis. World J Surg. 2003 Jun. 27(6):647-52. [Medline]. Mueller AR, Platz KP, Kremer B. Early postoperative complications following liver transplantation. Best Pract Res Clin Gastroenterol. 2004 Oct. 18(5):881-900. [Medline]. Ziser A, Plevak DJ, Wiesner RH, et al. Morbidity and mortality in cirrhotic patients undergoing anesthesia and surgery. Anesthesiology. 1999 Jan. 90(1):42-53. [Medline]. Nicoll A. Surgical risk in patients with cirrhosis. J Gastroenterol Hepatol. 2012 Oct. 27(10):1569-75. [Medline]. Leonetti JP, Aranha GV, Wilkinson WA, Stanley M, Greenlee HB. Umbilical herniorrhaphy in cirrhotic patients. Arch Surg. 1984 Apr. 119(4):442-5. [Medline]. Cryer HM, Howard DA, Garrison RN. Liver cirrhosis and biliary surgery: assessment of risk. South Med J. 1985 Feb. 78(2):138-41. [Medline]. Mansour A, Watson W, Shayani V, Pickleman J. Abdominal operations in patients with cirrhosis: still a major surgical challenge. Surgery. 1997 Oct. 122(4):730-5; discussion 735-6. [Medline]. Telem DA, Schiano T, Goldstone R, Han DK, Buch KE, Chin EH. Factors that predict outcome of abdominal operations in patients with advanced cirrhosis. Clin Gastroenterol Hepatol. 2010 May. 8(5):451-7, quiz e58. [Medline]. Trotter JF, Brimhall B, Arjal R, Phillips C. Specific laboratory methodologies achieve higher model for endstage liver disease (MELD) scores for patients listed for liver transplantation. Liver Transpl. 2004 Aug. 10(8):995-1000. [Medline]. [Full Text]. Perkins L, Jeffries M, Patel T. Utility of preoperative scores for predicting morbidity after cholecystectomy in patients with cirrhosis. Clin Gastroenterol Hepatol. 2004 Dec. 2(12):1123-8. [Medline]. Suman A, Barnes DS, Zein NN, et al. Predicting outcome after cardiac surgery in patients with cirrhosis: a comparison of Child-Pugh and MELD scores. Clin Gastroenterol Hepatol. 2004 Aug. 2(8):719-23. [Medline]. Cucchetti A, Ercolani G, Vivarelli M, et al. Impact of model for end-stage liver disease (MELD) score on prognosis after hepatectomy for hepatocellular carcinoma on cirrhosis. Liver Transpl. 2006 Jun. 12(6):966-71. [Medline]. [Full Text]. Teh SH, Christein J, Donohue J, et al. Hepatic resection of hepatocellular carcinoma in patients with cirrhosis: Model of End-Stage Liver Disease (MELD) score predicts perioperative mortality. J Gastrointest Surg. 2005 Dec. 9(9):1207-15; discussion 1215. [Medline]. Farnsworth N, Fagan SP, Berger DH, Awad SS. Child-Turcotte-Pugh versus MELD score as a predictor of outcome after elective and emergent surgery in cirrhotic patients. Am J Surg. 2004 Nov. 188(5):580-3. [Medline]. Befeler AS, Palmer DE, Hoffman M, et al. The safety of intra-abdominal surgery in patients with cirrhosis: model for end-stage liver disease score is superior to Child-Turcotte-Pugh classification in predicting outcome. Arch Surg. 2005 Jul. 140(7):650-4; discussion 655. [Medline]. [Full Text]. Northup PG, Wanamaker RC, Lee VD, Adams RB, Berg CL. Model for End-Stage Liver Disease (MELD) predicts nontransplant surgical mortality in patients with cirrhosis. Ann Surg. 2005 Aug. 242(2):244-51. [Medline]. [Full Text]. Teh SH, Nagorney DM, Stevens SR, et al. Risk factors for mortality after surgery in patients with cirrhosis. Gastroenterology. 2007 Apr. 132(4):1261-9. [Medline]. Hanje AJ, Patel T. Preoperative evaluation of patients with liver disease. Nat Clin Pract Gastroenterol Hepatol. 2007 May. 4(5):266-76. [Medline]. [Full Text]. Costa BP, Sousa FC, Serôdio M, Carvalho C. Value of MELD and MELD-based indices in surgical risk evaluation of cirrhotic patients: retrospective analysis of 190 cases. World J Surg. 2009 Aug. 33(8):1711-9. [Medline]. Neeff H, Mariaskin D, Spangenberg HC, Hopt UT, Makowiec F. Perioperative mortality after non-hepatic general surgery in patients with liver cirrhosis: an analysis of 138 operations in the 2000s using Child and MELD scores. J Gastrointest Surg. 2011 Jan. 15(1):1-11. [Medline]. Lawrence VA, Dhanda R, Hilsenbeck SG, Page CP. Risk of pulmonary complications after elective abdominal surgery. Chest. 1996 Sep. 110(3):744-50. [Medline]. [Full Text]. Fleisher LA, Beckman JA, Brown KA, Calkins H, Chaikof EL, Fleischmann KE, et al. ACC/AHA 2007 guidelines on perioperative cardiovascular evaluation and care for noncardiac surgery: a report of the American College of Cardiology/American Heart Association Task Force on Practice Guidelines (Writing Committee to Revise the 2002 Guidelines on Perioperative Cardiovascular Evaluation for Noncardiac Surgery) developed in collaboration with the American Society of Echocardiography, American Society of Nuclear Cardiology, Heart Rhythm Society, Society of Cardiovascular Anesthesiol... J Am Coll Cardiol. 2007 Oct 23. 50(17):e159-241. [Medline]. Fleisher LA, Fleischmann KE, Auerbach AD, Barnason SA, Beckman JA, Bozkurt B, et al. 2014 ACC/AHA guideline on perioperative cardiovascular evaluation and management of patients undergoing noncardiac surgery: executive summary: a report of the American College of Cardiology/American Heart Association Task Force on Practice Guidelines. Circulation. 2014 Dec 9. 130 (24):2215-45. [Medline]. Schemel WH. Unexpected hepatic dysfunction found by multiple laboratory screening. Anesth Analg. 1976 Nov-Dec. 55(6):810-2. [Medline]. Robbins JA, Mushlin AI. Preoperative evaluation of the healthy patient. Med Clin North Am. 1979 Nov. 63(6):1145-56. [Medline]. , Apfelbaum JL, Connis RT, Nickinovich DG, , Pasternak LR. Practice advisory for preanesthesia evaluation: an updated report by the American Society of Anesthesiologists Task Force on Preanesthesia Evaluation. Anesthesiology. 2012 Mar. 116(3):522-38. [Medline]. Rizvon MK, Chou CL. Surgery in the patient with liver disease. Med Clin North Am. 2003 Jan. 87(1):211-27. [Medline]. Powell-Jackson P, Greenway B, Williams R. Adverse effects of exploratory laparotomy in patients with unsuspected liver disease. Br J Surg. 1982 Aug. 69(8):449-51. [Medline]. Friedman LS. The risk of surgery in patients with liver disease. Hepatology. 1999 Jun. 29(6):1617-23. [Medline]. [Full Text]. Afdhal NH, Giannini EG, Tayyab G, Mohsin A, Lee JW, Andriulli A, et al. Eltrombopag before procedures in patients with cirrhosis and thrombocytopenia. N Engl J Med. 2012 Aug 23. 367(8):716-24. [Medline]. Conn M. Preoperative evaluation of the patient with liver disease. Mt Sinai J Med. 1991 Jan. 58(1):75-80. [Medline]. Rice HE, O'Keefe GE, Helton WS, Johansen K. Morbid prognostic features in patients with chronic liver failure undergoing nonhepatic surgery. Arch Surg. 1997 Aug. 132(8):880-4; discussion 884-5. [Medline]. Singh V, Dheerendra PC, Singh B, et al. Midodrine versus albumin in the prevention of paracentesis-induced circulatory dysfunction in cirrhotics: a randomized pilot study. Am J Gastroenterol. 2008 Jun. 103(6):1399-405. [Medline]. Singh V, Kumar R, Nain CK, Singh B, Sharma AK. Terlipressin versus albumin in paracentesis-induced circulatory dysfunction in cirrhosis: a randomized study. J Gastroenterol Hepatol. 2006 Jan. 21(1 pt 2):303-7. [Medline]. Keegan MT, Plevak DJ. Preoperative assessment of the patient with liver disease. Am J Gastroenterol. 2005 Sep. 100(9):2116-27. [Medline]. [Full Text]. Stephenson GR, Moretti EW, El-Moalem H, Clavien PA, Tuttle-Newhall JE. Malnutrition in liver transplant patients: preoperative subjective global assessment is predictive of outcome after liver transplantation. Transplantation. 2001 Aug 27. 72(4):666-70. [Medline]. Weimann A, Kuse ER, Bechstein WO, et al. Perioperative parenteral and enteral nutrition for patients undergoing orthotopic liver transplantation. Results of a questionnaire from 16 European transplant units. Transpl Int. 1998. 11 suppl 1:S289-91. [Medline]. Oppedal K, Møller AM, Pedersen B, Tønnesen H. Preoperative alcohol cessation prior to elective surgery. Cochrane Database Syst Rev. 2012 Jul 11. 7:CD008343. [Medline]. Tonnesen H, Rosenberg J, Nielsen HJ, Rasmussen V, Hauge C, Pedersen IK, et al. Effect of preoperative abstinence on poor postoperative outcome in alcohol misusers: randomised controlled trial. BMJ. 1999 May 15. 318(7194):1311-6. [Medline]. [Full Text]. Batchelder BM, Cooperman LH. Effects of anesthetics on splanchnic circulation and metabolism. Surg Clin North Am. 1975 Aug. 55(4):787-94. [Medline]. Ngai SH. Effects of anesthetics on various organs. N Engl J Med. 1980 Mar 6. 302(10):564-6. [Medline]. Strunin L. Anesthetic management of patients with liver disease. Millward-Sadler GH, Wright R, Arthur MJ, eds. Liver and Biliary Disease. London, UK: Saunders; 1992. 1381-91. Gut J. Molecular basis of halothane hepatitis. Arch Toxicol Suppl. 1998. 20:3-17. [Medline]. Maze M. Anesthetics and the liver. Miller RD, ed. Anesthesia. 4th ed. Edinburgh, UK: Churchill Livingstone; 1994. 1994. Gholson CF, Provenza JM, Bacon BR. Hepatologic considerations in patients with parenchymal liver disease undergoing surgery. Am J Gastroenterol. 1990 May. 85(5):487-96. [Medline]. Friedman LS, Maddrey WC. Surgery in the patient with liver disease. Med Clin North Am. 1987 May. 71(3):453-76. [Medline]. Fernandes NF, Schwesinger WH, Hilsenbeck SG, et al. Laparoscopic cholecystectomy and cirrhosis: a case-control study of outcomes. Liver Transpl. 2000 May. 6(3):340-4. [Medline]. [Full Text]. D'Albuquerque LA, de Miranda MP, Genzini T, Copstein JL, de Oliveira e Silva A. Laparoscopic cholecystectomy in cirrhotic patients. Surg Laparosc Endosc. 1995 Aug. 5(4):272-6. [Medline]. Ji W, Li LT, Wang ZM, et al. A randomized controlled trial of laparoscopic versus open cholecystectomy in patients with cirrhotic portal hypertension. World J Gastroenterol. 2005 Apr 28. 11(16):2513-7. [Medline]. [Full Text]. Belghiti J, Hiramatsu K, Benoist S, et al. Seven hundred forty-seven hepatectomies in the 1990s: an update to evaluate the actual risk of liver resection. J Am Coll Surg. 2000 Jul. 191(1):38-46. [Medline]. Delis SG, Bakoyiannis A, Dervenis C, Tassopoulos N. Perioperative risk assessment for hepatocellular carcinoma by using the MELD score. J Gastrointest Surg. 2009 Dec. 13(12):2268-75. [Medline]. Delis SG, Bakoyiannis A, Biliatis I, Athanassiou K, Tassopoulos N, Dervenis C. Model for end-stage liver disease (MELD) score, as a prognostic factor for post-operative morbidity and mortality in cirrhotic patients, undergoing hepatectomy for hepatocellular carcinoma. HPB (Oxford). 2009 Jun. 11(4):351-7. [Medline]. Hayashida N, Shoujima T, Teshima H, et al. Clinical outcome after cardiac operations in patients with cirrhosis. Ann Thorac Surg. 2004 Feb. 77(2):500-5. [Medline]. Filsoufi F, Salzberg SP, Rahmanian PB, Schiano TD, Elsiesy H, Squire A, et al. Early and late outcome of cardiac surgery in patients with liver cirrhosis. Liver Transpl. 2007 Jul. 13(7):990-5. [Medline]. Macaron C, Hanouneh IA, Suman A, Lopez R, Johnston D, Carey WW. Safety of cardiac surgery for patients with cirrhosis and Child-Pugh scores less than 8. Clin Gastroenterol Hepatol. 2012 May. 10(5):535-9. [Medline]. Pronovost P, Dorman T, Sadovnikoff N, Garrett E, Breslow M, Rosenfeld B. The association between preoperative patient characteristics and both clinical and economic outcomes after abdominal aortic surgery. J Cardiothorac Vasc Anesth. 1999 Oct. 13(5):549-54. [Medline]. Marrocco-Trischitta MM, Kahlberg A, Astore D, Tshiombo G, Mascia D, Chiesa R. Outcome in cirrhotic patients after elective surgical repair of infrarenal aortic aneurysm. J Vasc Surg. 2011 Apr. 53(4):906-11. [Medline]. Bush RL, Johnson ML, Hedayati N, Henderson WG, Lin PH, Lumsden AB. Performance of endovascular aortic aneurysm repair in high-risk patients: results from the Veterans Affairs National Surgical Quality Improvement Program. J Vasc Surg. 2007 Feb. 45(2):227-233; discussion 233-5. [Medline]. Cohen SM, Te HS, Levitsky J. Operative risk of total hip and knee arthroplasty in cirrhotic patients. J Arthroplasty. 2005 Jun. 20(4):460-6. [Medline]. Atmatzidis KS, Pavlidis TE, Papaziogas BT, Mirelis C, Papaziogas TB. Recurrence and long-term outcome after open cystectomy with omentoplasty for hepatic hydatid disease in an endemic area. Acta Chir Belg. 2005 Apr. 105(2):198-202. [Medline]. Demetriades D, Constantinou C, Salim A, Velmahos G, Rhee P, Chan L. Liver cirrhosis in patients undergoing laparotomy for trauma: effect on outcomes. J Am Coll Surg. 2004 Oct. 199(4):538-42. [Medline]. Georgiou C, Inaba K, Teixeira PG, Hadjizacharia P, Chan LS, Brown C, et al. Cirrhosis and trauma are a lethal combination. World J Surg. 2009 May. 33(5):1087-92. [Medline]. Cook MR, Fair KA, Burg J, Cattin L, Gee A, Arbabi S, et al. Cirrhosis increases mortality and splenectomy rates following splenic injury. Am J Surg. 2015 May. 209 (5):841-7; discussion 847. [Medline]. Dabbagh O, Oza A, Prakash S, Sunna R, Saettele TM. Coagulopathy does not protect against venous thromboembolism in hospitalized patients with chronic liver disease. Chest. 2010 May. 137(5):1145-9. [Medline]. Alter MJ, Kruszon-Moran D, Nainan OV, et al. The prevalence of hepatitis C virus infection in the United States, 1988 through 1994. N Engl J Med. 1999 Aug 19. 341(8):556-62. [Medline]. [Full Text]. American College of Physicians. Guidelines for assessing and managing the perioperative risk from coronary artery disease associated with major noncardiac surgery. Ann Intern Med. 1997 Aug 15. 127(4):309-12. [Medline]. [Full Text]. Armstrong GL, Wasley A, Simard EP, et al. The prevalence of hepatitis C virus infection in the United States, 1999 through 2002. Ann Intern Med. 2006 May 16. 144(10):705-14. [Medline]. [Full Text]. Burroughs AK, Matthews K, Qadiri M, et al. Desmopressin and bleeding time in patients with cirrhosis. Br Med J (Clin Res Ed). 1985 Nov 16. 291(6506):1377-81. [Medline]. [Full Text]. Child CG, Turcotte JG. Surgery and portal hypertension. Major Probl Clin Surg. 1964. 1:1-85. [Medline]. Farrell GC, Larter CZ. Nonalcoholic fatty liver disease: from steatosis to cirrhosis. Hepatology. 2006 Feb. 43(2 suppl 1):S99-S112. [Medline]. [Full Text]. Gill RA, Goodman MW, Golfus GR, Onstad GR, Bubrick MP. Aminopyrine breath test predicts surgical risk for patients with liver disease. Ann Surg. 1983 Dec. 198(6):701-4. [Medline]. [Full Text]. Hall JC, Tarala RA, Hall JL, Mander J. A multivariate analysis of the risk of pulmonary complications after laparotomy. Chest. 1991 Apr. 99(4):923-7. [Medline]. [Full Text]. Harville DD, Summerskill WH. Surgery in acute hepatitis. Causes and effects. JAMA. 1963 Apr 27. 184:257-61. [Medline]. Jackson FC, Christophersen EB, Peternel WW, Kirimli B. Preoperative management of patients with liver disease. Surg Clin North Am. 1968 Aug. 48(4):907-30. [Medline]. Jacob M, Copley LP, Lewsey JD, et al. Functional status of patients before liver transplantation as a predictor of posttransplant mortality. Transplantation. 2005 Jul 15. 80(1):52-7. [Medline]. Kroenke K, Lawrence VA, Theroux JF, Tuley MR. Operative risk in patients with severe obstructive pulmonary disease. Arch Intern Med. 1992 May. 152(5):967-71. [Medline]. Lerut J, Mathys J, Verbaandert C, et al. Tacrolimus monotherapy in liver transplantation: one-year results of a prospective, randomized, double-blind, placebo-controlled study. Ann Surg. 2008 Dec. 248(6):956-67. [Medline]. Millwala F, Nguyen GC, Thuluvath PJ. Outcomes of patients with cirrhosis undergoing non-hepatic surgery: risk assessment and management. World J Gastroenterol. 2007 Aug 14. 13(30):4056-63. [Medline]. [Full Text]. O'Leary JG, Friedman LS. Predicting surgical risk in patients with cirrhosis: from art to science. Gastroenterology. 2007 Apr. 132(4):1609-11. [Medline]. Patel T. Surgery in the patient with liver disease. Mayo Clin Proc. 1999 Jun. 74(6):593-9. [Medline]. Runyon BA. Management of adult patients with ascites caused by cirrhosis. Hepatology. 1998 Jan. 27(1):264-72. [Medline]. [Full Text]. Runyon BA. Surgical procedures are well tolerated by patients with asymptomatic chronic hepatitis. J Clin Gastroenterol. 1986 Oct. 8(5):542-4. [Medline]. Taketomi A, Kayashima H, Soejima Y, et al. Donor risk in adult-to-adult living donor liver transplantation: impact of left lobe graft. Transplantation. 2009 Feb 15. 87(3):445-50. [Medline]. Vanlemmens C, Di Martino V, Milan C, et al for the TRANSCIAL Study Group. Immediate listing for liver transplantation versus standard care for Child-Pugh stage B alcoholic cirrhosis: a randomized trial. Ann Intern Med. 2009 Feb 3. 150(3):153-61. [Medline]. Wiklund RA. Preoperative preparation of patients with advanced liver disease. Crit Care Med. 2004 Apr. 32(4 suppl):S106-15. [Medline]. Zacks SL, Sandler RS, Rutledge R. A population-based cohort study comparing laparoscopic cholecystectomy and open cholecystectomy. Am J Gastroenterol. 2002 Feb. 97(2):334-40. [Medline]. Zacks SL, Sandler RS, Rutledge R, Brown RS Jr. Liver disease markedly increases the risk of perioperative death in cholecystectomy patients [abstract]. Hepatology. 1997. 26 (program issue):179A. Egger ME, Squires MH 3rd, Kooby DA, Maithel SK, Cho CS, Weber SM, et al. Risk stratification for readmission after major hepatectomy: development of a readmission risk score. J Am Coll Surg. 2015 Apr. 220 (4):640-8. [Medline].